In November 2006, my wife, her brother, and I began to pray the Service of the Typica on Sundays, as we embarked on our journey to establish an Old Calendar Orthodox Christian mission parish in Raleigh, North Carolina. For the first year, we were often alone, only being joined a few times by others. 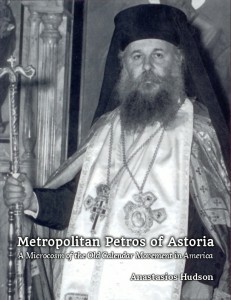 Eventually, the Metropolitan decided to ordain me a priest in 2008, so that we would have a regular sacramental life and so that we would have a greater ability to spread the faith. Interestingly enough, about the time that the bishop decided to ordain me, a man in Raleigh contacted me and began to attend service. He eventually became my chanter. The same month, a family contacted me from Greenville, North Carolina, and expressed a desire to have a parish in their area. They were able to get together the resources to provide a location for worship, and this led to the Greenville mission growing much faster than the Raleigh mission. Now, our Greenville mission is doing quite well, is self-supporting, has a building, and is able to reach many people in the community. In Raleigh, we are still meeting in my home chapel, though. In the beginning, my wife and I reasoned that God wanted us to focus on growing the Greenville mission, which was a considerable feat given the distance, lack of resources, and small number of attendees in the beginning. However, through Grace, the community grew, and now has 30+ members. Recently, though, more and more people have been contacting me in Raleigh, and asking me questions about the faith. It’s kind of ironic, because I am not able to walk around Greenville witnessing and evangelizing and inviting people to our parish, but in Raleigh, where I live and have many contacts, I am not able to invite people to a Church, because we meet in my home chapel. Sure, I invite some people, but discernment is necessary as there are unfortunately dangerous people out there, and at the same time, many are uncomfortable to worship in a home chapel as well, even though this is the way of the early Christians. Hence, in Raleigh we are in a bit of a Catch-22: we need more people to be able to afford to rent or own a building, and we need a building to attract more people! Of course the Church is not only about the building, but rather is about Christ and a relationship with Him and through Him other human beings, but the Church building does provide an important function in providing a beautiful worship space, a place where visitors feel welcome, safe, and possibly anonymous if that is their desire, and fellowship opportunities. I make the most of what I’ve got, and minister to people whose needs are not met by the established parishes in the area, but I nonetheless know that more people could be reached if we were to have a place to meet. Seeing how the Lord has blessed Greenville, I am not worried about the future, and know that in God’s time, we will obtain a permanent place to worship and fellowship. I do want to highlight our situation, however, because I know that there are people who could bring us a step closer to obtaining a Church building if they only knew of our presence in the area. Perhaps that is why you are finding this article. We do not seek an extravagant Church building, but we do seek to have something meager in which to worship, fellowship, and serve. If you have the means to help us make this happen, or you are able to assist partially, please let me know. If you belong to a Church that is going through hard times and may be on the verge of closing, please let your community know about our struggle and if possible, perhaps we could take over your building if you feel you are unable to continue. By 2014, we can obtain a place to gather formally, and together is how we will do it. Keep us in your prayers, and let us know if you wish to help!